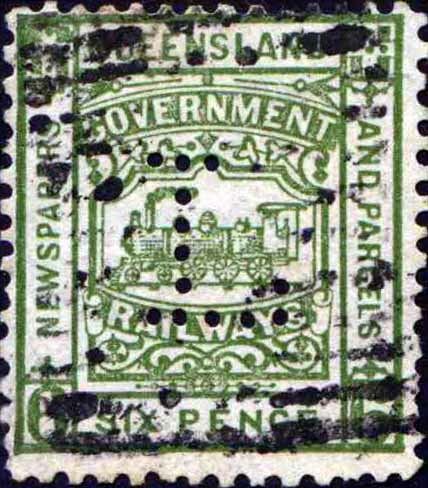 Railway use only: Railway stamps from Lowood Creamery were used at Brisbane station only. 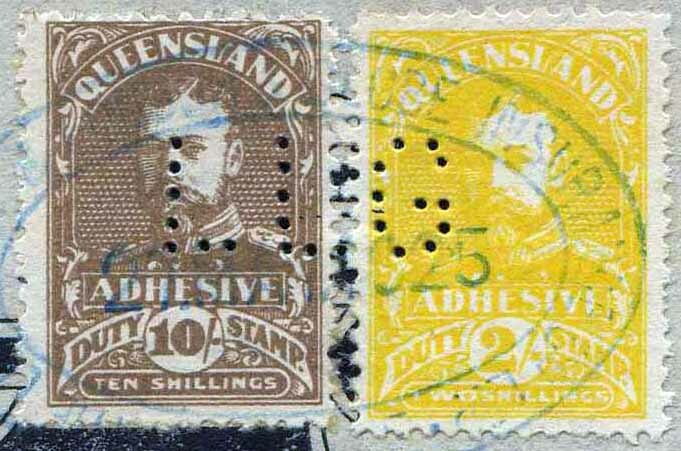 1902 Issue 1d, 3d, 6d. This perfin was in use for less than 12 months hence it's rarity. Rarity Scale: 1902 issue 1d R4, 3d R4, 6d R3. Proof Pulls [Two of each recorded] R4. 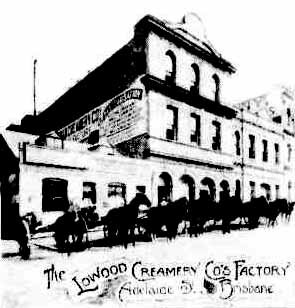 Background: *The Lowood Creamery Company was registered on 23 February 1901 following a merger which included the long established Messers Howes Bros, who had built the first creamery in Queensland. The company had its head office in Adelaide Street Brisbane, with numerous factories and depots spread throughout Queensland. The cream was carried to Lowood for manufacture and it was from this address the company derived its name. The company's country butter factories were established at Willowburn, Tiaro, Boonah, Lowood, and Beaudesert with cheese factories situated at Elbow Valley, Grey Mare, Tangan in the Warwick District, and also at Bringabilly near Pittsworth. The business was large and this required an extensive refrigerating plant as well as cold stores and offices which were all located at the Adelaide Street site. The company went into liquidation on 11 Sept 1912. * National Library of Australia. Note: Other publications have incorrectly listed the address of the Location of the perforator as Lowood. Device: Triple vertical head. Made by the Queensland Government Printer. 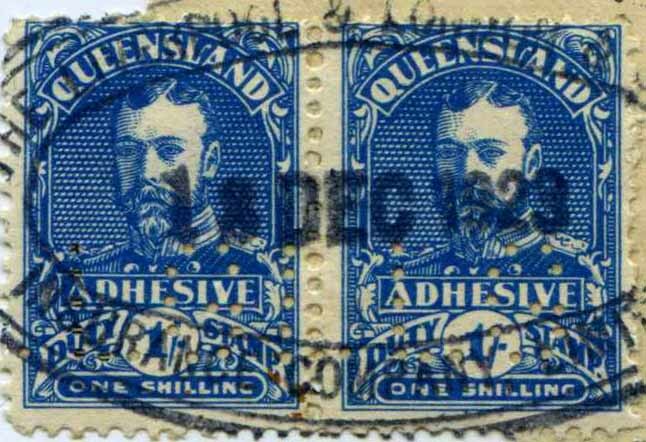 Note:In all other published works the 'L' perfin is listed as not having been used on the postage stamps of Queensland. 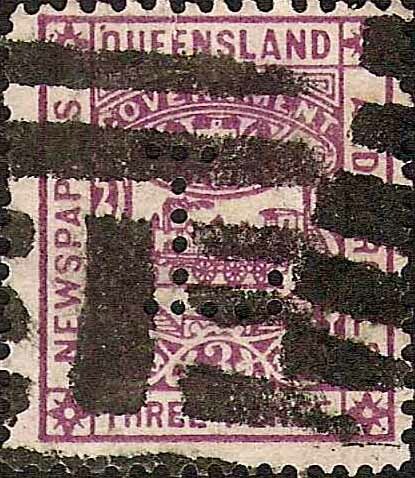 Below shows the top two strips which were prepared by the Queensland Government Printer for postal use but, due to the fact that they did not line up with the size of the postage stamps, the pins were removed for perforation purposes. It is further noted that only the pins within the stamp design were removed, leaving the pins within the horizontal, but slightly irregular perforation line. The perforation machine was put to service in 1911, but was found unsuitable, and it was quickly withdrawn with only a sheet or two released. 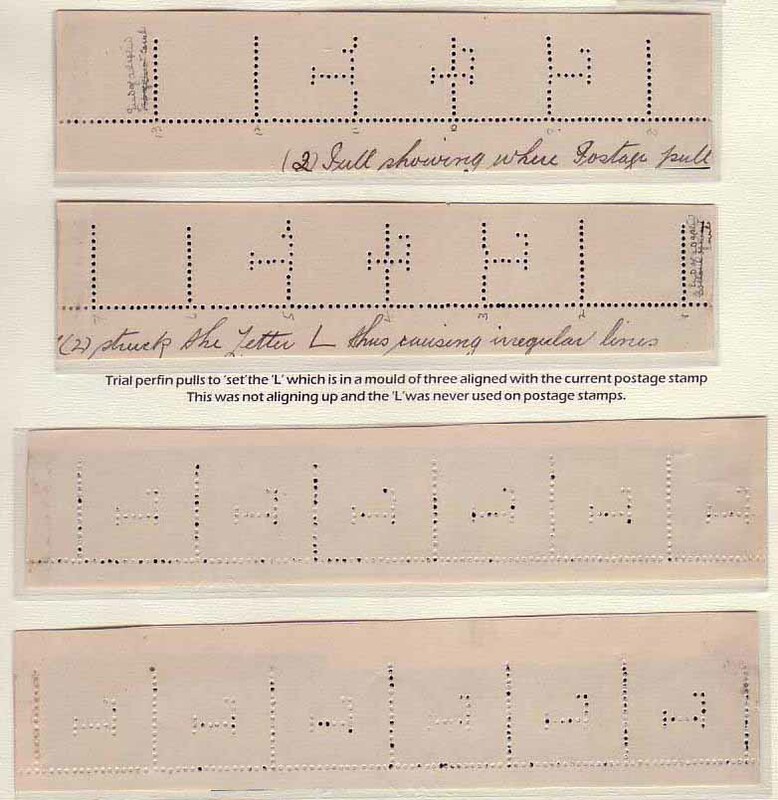 The perforation became known to philatelists as the 'Railway Perf' (10½ to 12½). This irregular perf is listed in the S.G. catalogue No. 313. So we have a situation where part of the L perfin was in fact used on a postage stamp, and could then by definition be included in a specialised perfin collection. Rarity Scale: KGV 1920 issue 1d, R4, 2d R4, 4d R4, 8d R4, 1/- R3, 2/- R4, 3/- R4, 5/- R4,10/- R4. Background: *Liverpool and London and Globe were an English insurer established in 1836, (until 1865 they were registered as "The Liverpool and London Fire and Life Insurance Company"). They started operating in Sydney in the 1850 and in 1851 they acquired the "Australian Colonial and General Life Assurance Company". There business expanded slowly from their Sydney main office and they established offices in Tasmania and Western Australia as well as Brisbane in 1911. Device: The Brisbane LLG device was one of a range of devices used by this company in their offices across Australia. 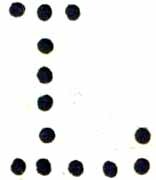 The Brisbane device formed a single line pattern with quite thin pins. Later use (from the mid 1920’s) is characterised by a missing pin in the top right hand corner of the G.
In the 1940’s this LLG device appears to have been altered or repaired and it once again produces a pattern with a full G, however the L’s are distinctly different in particular the base of each L. This variation to the pattern has not been reported on revenue stamps as yet. Note: As shown above, this pattern was sometimes used as a cancelling device and appears to have been done so when the perfin was missed. Note: LLG first chose to precancel their revenues with a blue overprint. SeeOther Tab. 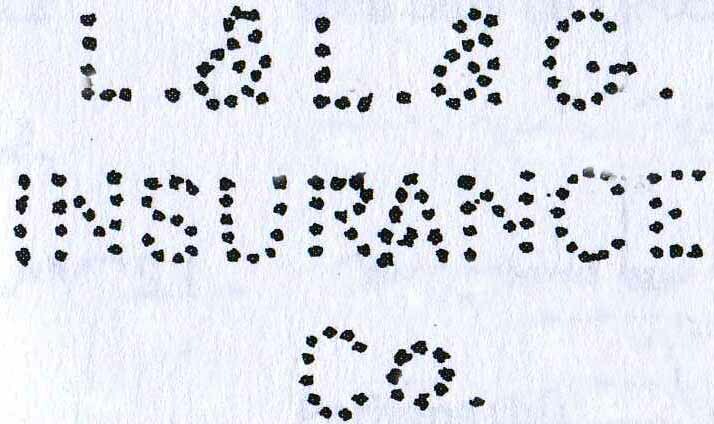 Note: Please read below as the complete L.&L.&G./INSURANCE/Co.a [below] was dismantled with only the centre line used in Brisbane. It could be argued that this perfin belongs under I for Insurance. Complete pattern above NOT used in Brisbane. 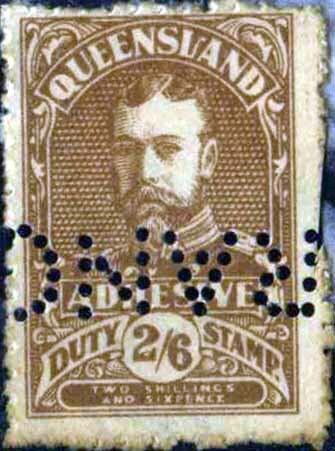 Revenue Use: KGV 1920 issue 2/6d, 5/-. Rarity Scale: KGV 1920 issue 2/6 R4, 5/- R4. Device: This device was most likely designed for use as a cancelling punch for documents rather than a perforating device for stamps. It is first found used on both postage and revenue stamps at the Sydney office from about 1910-1919. Due to the size of the pattern these are always found as partials. In about 1919 the device was moved to the Brisbane office. The use in Brisbane is much rarer and oddly it only produced strikes of the single word “Insurance”. It may be that the device was altered prior to its movement to Brisbane or that it was damaged in transit, or indeed that modifications were made in Brisbane. This “Insurance” pattern is only found on revenue stamps but may have been used on postage stamps as well. The usage is short lived and in about 1920 the Brisbane office started using the LLG.a device. 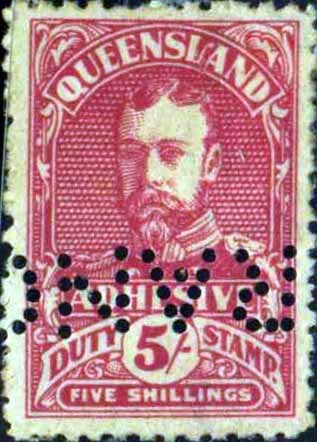 From the mid 1920's a bulk payment system was implemented making redundant the use of duty stamps in Queensland only.